Laddu Holi of Barsana was celebrated on 20th March. During the famous Laddu Holi, Laddu(s) are thrown on devotees. 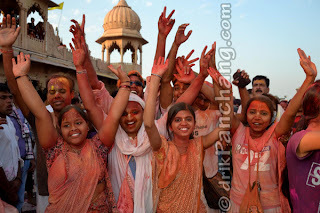 Laddu Holi is celebrated at Ladli temple of Barsana. Ladli temple is also known as Sriji Mandir which is dedicated to Lord Krishna and His beloved consort Radha. Devotees and visitors gather in huge number to watch this spectacular event. Laddu(s) are captured by devotees as those are considered the holy Prasad of God. Laddu(s) are thrown from the roof top of the temple and collected by devotees waiting eagerly at the ground floor. Laddu Holi is played with dry colors using only Gulal and Abeer. The whole temple premises are covered with clouds of dry colors and fragrance of Kesar. The Holi with wet colors is played on the next day. With Laddu Holi the whole atmosphere is warmed up for the Lathmar Holi which is scheduled on the next day of Laddu Holi. On Laddu Holi day, the invitation to play Holi is sent to Nandgaon, the town of Lord Krishna. The invitation is sent by the people of Barsana, the town of Goddess Radha. The invitation to visit Barsana to play Holi with the female cowherds is accepted by the people of Nandgaon. To confirm the acceptance of the invitation one Panda (पण्डा) or messenger visits from Nandgaon to Ladli Ji Mandir. It is believed that Laddu(s) were offered to welcome the messenger. The messenger was so overwhelmed by the hospitality that he started throwing them. Since then the tradition of Laddu Holi has begun and it is played each year. The dance of Panda in devotion of Lord Krishna is also popular during Laddu Holi of Barsana.